now reading: Natural Areas Are Disappearing. Lawmakers, Act Now. Natural Areas Are Disappearing. Lawmakers, Act Now. When Katharine Lee Bates, author of “America the Beautiful,” stood atop Colorado’s Pikes Peak in 1893, “purple mountain majesties” and “fruited plains” extended in all directions below, largely unbroken until the horizon. If Bates were alive and made the climb today, she would gaze out on a landscape that, while no less breathtaking, has changed dramatically: roads and transmission lines now climb mountain passes to the west; new homes tuck themselves into fire-prone forests to the north; abandoned mines hide to the south; and Colorado Springs, my hometown, spreads to the east. The view from any mountain in the West today could make one wonder: how much of the West’s forests, wetlands, and deserts have been lost to development, and how fast are these natural areas still disappearing? Until now, this question went unanswered. In partnership with a team of scientists from the non-profit Conservation Science Partners, we at the Center for American Progress set out to answer this question by developing the first-ever comprehensive map of development across eleven Western states: Arizona, California, Colorado, Idaho, Montana, Nevada, New Mexico, Oregon, Utah, Washington, and Wyoming. The results (available at our website) are startling. 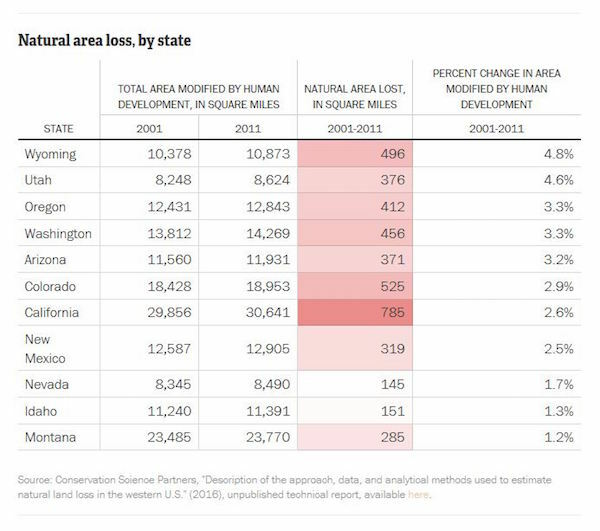 Between 2001 and 2011, the West lost a football field’s worth of natural area to development — every two and a half minutes. In other words, over the course of an average year, the West lost a Los Angeles-sized area of land to new housing, oil and gas wells, mines, roads, and other infrastructure. The fragmentation of habitat is pushing more and more western wildlife populations to the brink of extinction. In California alone, more than 300 plant and animal species require the protection of the Endangered Species Act to survive and recover. And across the region, more than 40 percent of snakes, lizards, and other reptile populations are decreasing. Unfortunately, however, questions about land and wildlife conservation command relatively little attention today in the U.S. Congress and in state capitols. In the eyes of some politicians, the West’s open spaces are not only well protected but excessively protected by national conservation laws. A Congressional anti-parks caucus, for example, wants to block new national parks and sell off the West’s national forests to private owners. 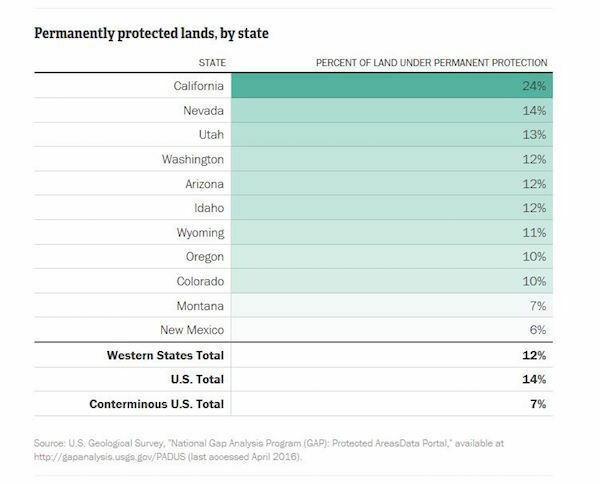 But, in truth, only a small fraction — 12 percent — of Western lands are permanently conserved through national park, wilderness, and other protective designations. The overwhelming majority of the West is composed of privately and publicly owned areas where a variety of uses is allowed, from mining and energy extraction to grazing and logging. Of the lands managed by the Bureau of Land Management, for example, 90 percent are available for oil and gas drilling. The challenge ahead for policymakers is to decide how to guide continued growth while ensuring that the wild areas that provide clean air and drinking water and make the region so special do not vanish. Thankfully, there is still ample opportunity to protect what is left. Private landowners and land trusts can help safeguard remaining natural areas through conservation easements and wise agricultural practices. Cities can minimize their footprints and expand outdoor recreation opportunities by refining their plans for smart growth. States can establish permanent funding streams for the protection of open spaces and wildlife habitats. Congress can renew and fully fund the Land and Water Conservation Fund, which uses offshore oil and gas revenues to create parks and protect at-risk lands. And both state and national land management agencies can guide energy development, logging, transportation, and mining to places with the fewest conflicts. Policymakers can take a lesson from President Theodore Roosevelt, who fiercely believed that some wild places should be set aside for future generations. By permanently protecting more of the West’s public lands as wilderness areas, national parks, wildlife refuges, and monuments, we can preserve large, contiguous, and ecologically healthy landscapes across the region. President Obama, for one, is doing his part. Through the establishment of national monuments, he has helped safeguard the Mojave Desert in California, the canyons of the Rio Grande in New Mexico, remote mountain ranges in Nevada, and the backcountry of central Colorado. Though the current Congress has spent more time trying to roll back protections for lands and waters than advancing them, some lawmakers have worked steadily to support locally-led conservation efforts. Representative Mike Simpson (R-ID), for example, recently succeeded in passing a law to protect the wild peaks of the Boulder-White Clouds in Idaho after years of thoughtful and deliberate negotiation and compromise. Yet, even with the halting progress of land conservation efforts around the West, the clock is ticking. Archaeological sites in the sacred Bears Ears area of southern Utah are being looted. The plateaus that feed water into the Grand Canyon are at risk of uranium mining. And the stunning Gold Butte area of southern Nevada — where Cliven Bundy has been illegally grazing cows for years — remains unprotected, to name just a few. Whether and how we collectively safeguard these places — as well as dozens like them that are feeling the squeeze of development — will shape the character of the West for generations to come. Even as we celebrate the centennial of our national park system in 2016, much of the story of land conservation in the West is yet to be written. Matt Lee-Ashley is a senior fellow and director of public lands at the Center for American Progress.